The H-D™ Used Motorcycle Limited Warranty is available on all used H-D® motorcycles fewer than 7 years old with less than 25,000 miles. 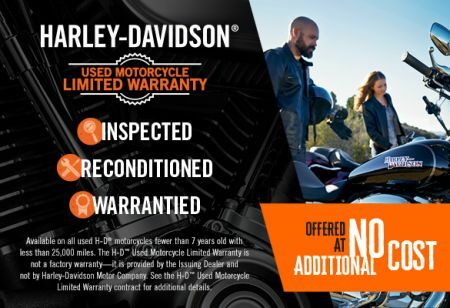 The H-D™ Used Motorcycle Limited Warranty is not a factory warranty -- it is provided by the Issuing Dealer and not by Harley-Davidson Motor Company. See the H-D™ Used Motorcycle Limited Warranty contract for additional details. Visit our Finance Consultants for full details!